India celebrates 60th Anniversary of freedom on 15th August 2007. 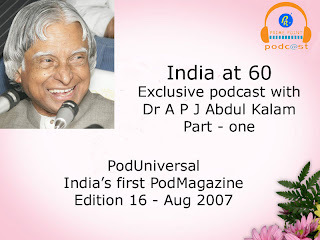 In an exclusive telephonic interview to PodUniversal , Dr A P J Abdul Kalam, former President of India shares his views on the 'Top ten challenges' of the Nation. He also shares his views as to how youth can overcome these challenges to realise the vision of developed India by 2020. We will be publishing his other views in the coming weeks. If you want to download the wmv file (audio with visuals) of this podcast interview, please right click here and save the link to your desktop ( 4 mb ). You can play wmv file in your windows media player. He is a great man, I want him to be President of India again, he is always in my heart, as per his suggetion i am always thinkiong about the nation how to get the thing done regarding the vision of india 2020.
after hearing a speech of abdul kalam,I came to the conclusion that "My road to success is never complete, it's always under construction",Lets join our hands together & make India a super power!!! i think he is the best ever president that we have ever.he was so particular,i can remember i send him a postcard and his photograph with his autograph,he gave it to me.that was like a president of common man.we all miss you sir. when i was studying 12th std,i heard abt Mr.A.P.J.Abdul Kalaam abt his work in Pokran,and he told all Youth to Dream,If we Dream one day it will come true,Yeah Its true in my life,my all friends teased me from my childhood,but watever i dreamed abt my future its happening,wat we dreamed we will be like that in future,still i m dreaming may be in 2020 my dream also come true. Need A.P.J. Blessings. It's APJ again...I always aspire to become a person like him...with such great personality!! I look forward in meeing him[aleast in my dreams..!! ].As always APJ says-Dream,dream,dream, Dreams transform into thoughts, And thoughts result in action...Since I'm in 12th, I believe that I can do it!! !